I am a sucker for certain NEW products. Make-up and snacks with the words NEW or SEASONAL on them get me every time. The little fish were adorable as usual and fun to eat. The vanilla taste is mild but doesn't really taste cupcake-y. They're good but don't make me think I'm eating a vanilla cupcake. More like a vanilla cracker. These would be cute at any party and kids will of course gobble them up. Home-made marshmallows is something I'd like to try making. I've never had a home-made marshmallow and I hear their little pillows of goodness. So I picked up this book at the library and thought one Saturday while my mans working I'll make some and have my first taste of a home-made marshmallow. The grocery store had other plans. I took a short cut to the produce through the bakery section and again, my peripheral vision spotted these little bags. Curious, what's in the bags? ooooh, homemade marshmallow's! How did the store know I was going to try making these. They were a little pricey but I had to try some. Two things helped make my decision for me. They're made in Seattle which is my neighbor to the North and the simple ingredients. While checking out the cashier, a male, spotted these in my cart and started chatting to me about home-made marshmallows. How to make them, how good they taste, what tools you need and tips in making them. Quite possibly the funnest conversation I've had with a cashier at the grocery store. mmmm, these are good. I was expecting to need a glass of milk to wash these down since they're peanut butter. To my surprise the peanut butter taste was nice and light. Not over powering and it let the marshmallow taste come through. These are light and fluffy and not processed tasting at all. 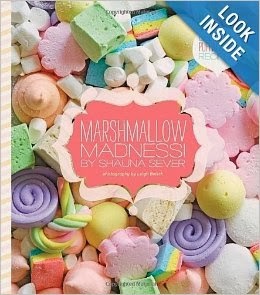 I'm definitely going to try making my own home-made marshmallows. Are you a sucker for new food products too? Have you tried home-made marshmallows or made them yourself?